Alexis Preller. 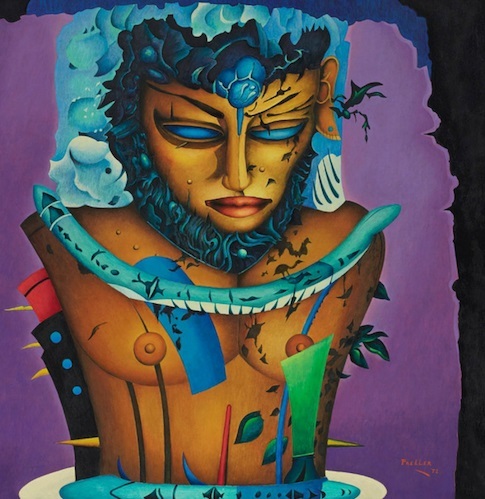 Titled Adam, from 1972, this tantalising painting is one of a group of important later paintings depicting Adamic or Apollonian figures, and the one which Preller himself selected, of only five works chosen to represent him at the São Paulo Biennale of 1973. The fact that Aspire brings such market-leading examples of the work of two widely disparate but highly respected artists to auction, indicates the positive position the auction house has carved out for itself. 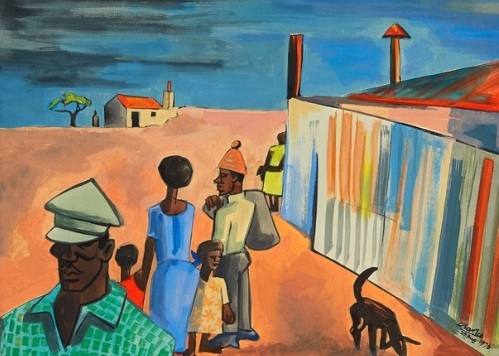 Among the other auction highlights is a standout piece by much-loved Cape Town artist Stanley Pinker. 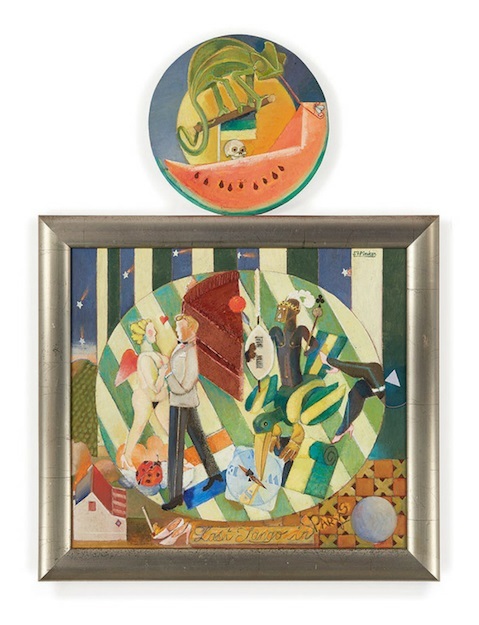 His painting The Last Waltz exhibits a characteristic sense of formal experimentation in the superimposition of a tondo above the conventional rectangular frame of the painting. In keeping with Pinker’s interest in bringing together elements of Cubism with more localised subject matter, both surfaces depict a miscellany of South African objects and characters in the whimsical dance of the title. Jo Ractliffe and Pieter Hugo, and a sculpture by former Standard Bank Young Artist Award winner Michael MacGarry. In keeping with its commitment to sustainability and industry development, Aspire will apply its Artist’s Resale Rights (ARR) initiative. In its willingness to help grow and develop the African art market, Aspire Art Auctions is the first, and to date only, South African auction house to pay living South African artists royalties on the resale of their works of art. The initiative is undertaken entirely at Aspire’s cost, and demonstrates its commitment to the growth of the African art market. Aspire’s work on its ARR project, has to date earned over R400,000 for more than 90 artists, and was recently acknowledged with the award for Best Strategic Project of 2018 at the coveted Business Arts South Africa annual awards. Aspire Art Auctions is a South African-based, specialist auctioneering company formed to respond to the requirements of the country’s rapidly growing art industry. Specialising in historical, modern and contemporary art, the company is headed by a grouping of partners with formidable collective knowledge and expertise – together representing the longest combined secondary art market presence in South Africa. 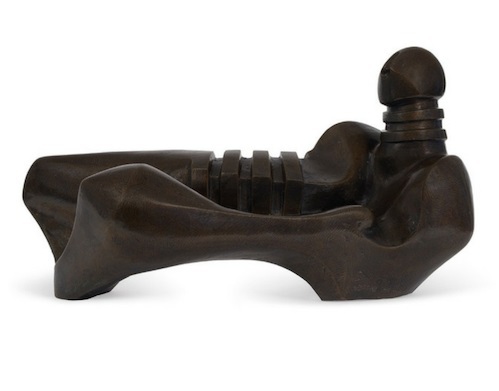 With combined art industry experience of more than eighty years, Art Specialists Emma Bedford, Jacqui Carney, Mary-Jane Darroll, Ruarc Peffers and Marelize van Zyl produce curated auctions of top-quality international, African and South African art. Aspire is also the only South African auction house to offer an Artist’s Resale Rights (ARR) royalty scheme to living South African artists whose works sell on its auctions. In the absence of national legislation, Aspire voluntarily bears the entire cost of this initiative in order to demonstrate its commitment to the sustainability of the South African art industry. This makes Aspire Art Auctions unique in the local auction world. But its key differentiator is its knowledgeable team of specialists, whose exclusive focus on fine art ensures that works of art are presented in comprehensive historical and cultural contexts and on the best possible display platforms.